France in the eighteenth century was a hothouse for philosophical investigation and scientific inquiry. But in order to cultivate the mind and reap the benefits of the explosive intellectual environment of the age of Enlightenment, one would have to be of an origin that granted a title or wealth, preferably both. Certainly one needed to be male. But on rare occasions circumstances and stunning talent presented opportunities for a woman to champion her abilities and bring to bear her ideas and aptitude. Indeed the erudite qualities of Madame la marquise Emilie du Châtelet, whose feats spanned theoretical research in astronomy and physics, translations of Latin and Greek plays and philosophy into French, are astonishing for modern day scholarship. Emilie wrote exegetical studies of the bible, a treatise on happiness, and argued in support of women’s education. But her passion was for physics, particularly the understanding of classical mechanics toward which she hired tutors to teach her mathematics and translated Newton’s “Principia Mathematica” even as she challenged his equation on the relation of force to mass and velocity. 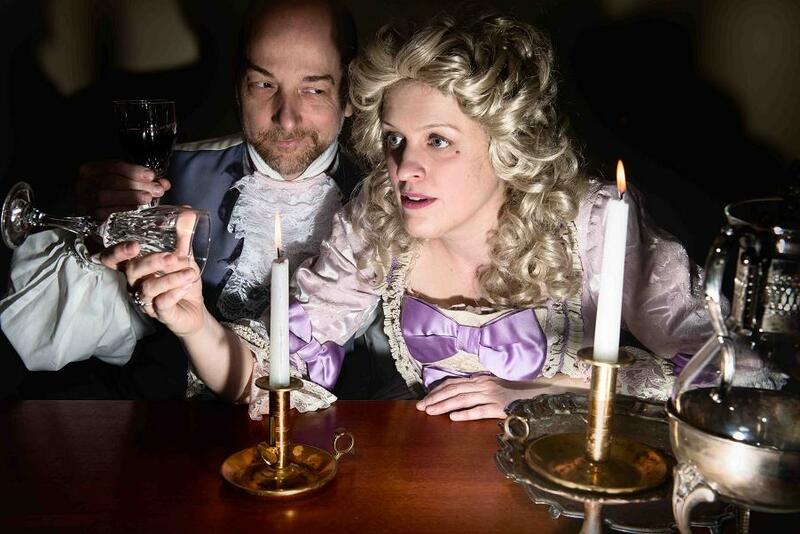 Theatre Pro Rata’s production of Emilie: La Marquise du Châtelet Defends Her Life Tonight is staged in the charmingly apt space of a science lecture hall on the campus of St Catherine University in St Paul. The play, written by Lauren Gunderson, is narrated by Emilie from the realm of her afterlife, finding herself observing her own life story. The blackboard, which is increasingly covered by equations and estimations as Emilie questions the scientific validity of Newton’s relation, is the background to a sequence of scenes from her life, most notably her collaboration and love affair with the philosopher Voltaire. For in the best tradition of eighteenth-century libertinism, Emilie, married and mother of three, welcomes Voltaire (and other lovers) to her house and cherishes his companionship and their scientific accomplishments. Directed by Carin Bratlie, the podium qua stage and the academically adorned blackboard play off of each other and underscore the kinship of living structures of complexity, be it in the form of physical laws or emotional vagaries. Brief but laden with sharp sarcasm or savvy retorts, each scene pulls us into an intimate exchange, brainy determination or conflict without letting it turn into narrative gossip. We do not know what Emilie’s nature was, but Shanan Custer infused her character with acuity, perspicacity, wit, and compassion with a balance that could only have delighted and gratified the illustrious historical Emilie. Matt Sciple (Voltaire) as the rest of the company altered their roles – and gender – and performed with the kind of indulgence that attests to the pleasure they took in portraying the life of this astounding woman. These crisp but somewhat laconic scenes do, however, deprive the performers from portraying the characters’ drama more elaborately. Rather than an as effort to find out whether she had been correct in challenging Newton’s assumption, the play leads Emilie in a reenactment of her life, where the essential pursuit becomes the affinity between energy and love, the universe and the heart, science and drama. “Time and space are generous tonight,” says Emilie as she introduces herself. This generosity will prove itself in its harboring of the equivalence between the purpose of the living force in physics and progeny, the offspring of intimate relations with lovers. The questioning that gradually developed into insight – that force is equal to the relation between mass and the exponent of velocity – only hints at the scientist’s achievement in anticipating Einstein’s formula for the theory of special relativity if the speed of light is expressed exponentially. Today’s audiences are at least partially aware of the tortuous journey that women took to gain entry into positions of knowledge, a theme which the characters reiterate throughout the play. But it remains incumbent on our society, our artists and writers, forcefully to call attention to the extent of accomplishment to which women can and have arrived. A more fully dramatized Emilie would do more than point to the possibility or wonder whether it has a purpose. Even so, this production charmingly plucks Emilie out of near oblivion and reminds us that the power of knowledge shines not only in the relations within the equation but in those between people who make them. One of the best things about modular display stands is that you can also add new sections. product. An alternative to a pop-up stand is the banner stand.